Our club pins can be purchased at the clubhouse. Club shirts and polo style baseball hats with an embroidered palm tree logo are also for sale at the clubhouse. We bowl every Saturday at 10 am. 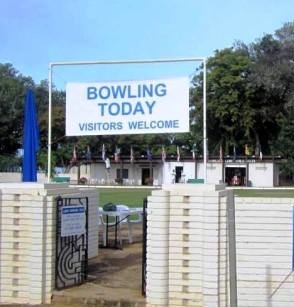 There is bowling on other days. Often there are games at 10 am on Monday, Wednesday and Friday. Free lessons for Beginners and free use of equipment every Saturday morning from 9.20 am to 9.50 am. Join us at the green. The club has a variety of bowls to loan and visitors are not required to follow a dress code other than wearing flat-soled shoes. It is a universal rule in lawn bowling that shoes with heels are not allowed because they may damage the playing surface. Members and visitors are requested to arrive at the green 10 minutes earlier than playing times so that they can be acquainted and be there when we make up teams. Our bowling green is maintained by Greens-keeper Mr. Ray Ito. Its playing surface runs at 13 to 16 seconds, typical of many outdoor natural grass greens but slow in comparison to those with artificial surfaces that are 18 seconds or more. To find the green see the directions at our Find the Green page.